Diseases can be classified as infectious or lifestyle diseases. While the former is largely due to involvement of external pathogens, lifestyle diseases are often considered preventable, as they are often the result of our own faulty dietary and lifestyle habits. Hence, they are also referred to as lifestyle diseases. Hypertension belongs to the category of lifestyle diseases. Often referred to as a ‘silent killer’, it is important that you get your blood pressure checked often, and keep it under control. High blood pressure is the result of increase of arterial blood pressure, causing the heart to pump blood into the arteries at a quicker rate and it is detrimental to the overall health of a person. Ayurveda considers high blood pressure as a result of imbalance of two doshas – vata and pitta. The Ayurvedic treatment for high blood pressure aims to balance these doshas. At times, an imbalanced kapha can also cause high blood pressure. High blood pressure requires a calculated approach of treatment, and Ayurveda helps you with that. If you are already hypertensive, Ayurveda suggests the following simple lifestyle modifications that may help you in managing your blood pressure in an effective manner. Maintaining a proper daily routine (dinacharya) is vital to balance your blood pressure levels. Therefore, remove all unnecessary distractions that come in the way of following a healthy daily routine. Fix a proper sleep-wake schedule, a definite time slot to work-out and meditate. Have a gadget-free time at least one to two hours prior bed time, and sleep early. Also, make it a habit tow ake up early and do any form of mild exercise or yoga. Such a schedule ensures that your body’s natural biorhythm remain balanced and ensure normal blood pressure levels. A good night’s sleep is vital to ensure that all our body parts are well-rested and ready for the activities of next day. Sleep rejuvenates the tissues of the brain and all parts of the body. Ayurveda believes that a good sleep pattern helps in balancing doshas and also helps in formation of ojas (energy). This is the reason that when you do not get enough rest at night, you may feel more weak or fatigued the next morning. Applying a little sesame oil on your head and soles of the feet during bedtime, can help you have a relaxed sleep. Similarly drinking a cup of lukewarm milk with a pinch of turmeric during bedtime is considered to be beneficial for a good sleep. Stress and anxiety are associated with hypertension. Meditate every morning for 15 to 20 minutes, apart from practicing controlled breathing techniques like ‘Bhramari’ and ‘Anulom-vilom’. Meditation fills your mind with positivity and brings peace of mind and calms your body and soul. Vitiated vata dosha can cause hypertension. Therefore apart from doing gentle exercises in the morning, practice ‘Abhayanga’ (self-massage) with sesame oil, as it helps in balancing the doshas in the body. Abhayanga is also good in improving circulation in the nervous system and lymphatic vessels. You can do self-massage at home, and once in a few days, get a massage done at a good panchakarma centre. A balanced body weight plays a key role in keeping diabetes and blood pressure at bay. To achieve this, avoid eating junk food, packaged and processed foods as they do not have ‘prana’. Substitute them with fresh vegetables and fruits cooked in a healthy manner. Some dietary modifications to rebalance the vitiated doshas in case of a person with high blood pressure, as suggested by Ayurveda are staying away from triggers and intake of food that helps the body achieve a state of equilibrium. The best way to do this is to follow a vegetarian diet. Include vegetables such as bitter gourd, parsley, garlic and drumstick, and fruits such as watermelons, guavas, bananas and grapes. Dairy products such as milk, cottage cheese and butter are good additions too. However, take care to cut down on caffeine, as it is believed to further irritate the system and shoot up the blood pressure. Similarly reduce intake of salt in the diet, and reduce the amount of cereals and pulses. Also, remember to completely avoid eggs, red meat when trying to balance the doshas and reduce the incidence of high blood pressure attacks. Regular exercise helps in keeping your mind and body healthy, and keeps all diseases at bay. Apart from contributing to the overall wellness of your body, it also helps reduce high blood pressure. Practice gentle exercises such as brisk walking for 30 minutes. Also include yoga and meditation as part of your morning routine. While breathing techniques and meditation helps by keeping you stress-free, walking has shown to reduce blood pressure and improve heart health. Apart from recommending these lifestyle modifications to alleviate symptoms of hypertension, there are several herbs prescribed by ayurvedic experts to manage hypertension and protect the internal organs of the body. Some of recommended ones are ‘Gokshura’ (a diuretic and ACE inhibitor), ‘Sarpagandha’, and ‘Gulkand’ (uplifts mood and keeps tension at bay). 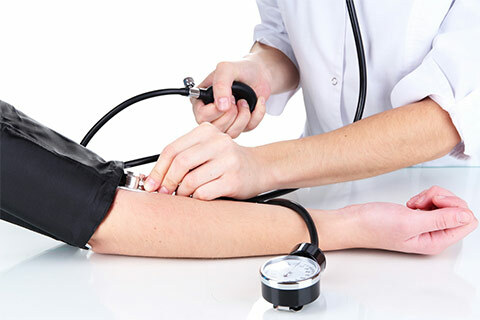 Note: Although hypertension is common among people over 50 years of age, the in the present generation several youngsters are seeking treatment for hypertension. Apart from following the suggested lifestyle measures, consult a doctor if you have a blood pressure reading of 140/90 or higher.